AccountEdge is one of the best mac accounting software and management solution for your Mac system. With this software, you can create and track various sales and purchases along with run payroll, manage contacts, track and also build inventory, etc. The double-entry system implies is that it allow you accountant to work easily when it comes peruse your file. This software provides you to create quotes, invoices for services, or items sold. It also allows you to process the payments on various orders and invoices. In case you have any repetitive transactions that are required to be recorded or daily or monthly transactions, and much more, you can enter these entries. With this application, you can receive and pay money, prepare various electronic payments and bank deposits, reconcile accounts or print checks. The user can easily spend money without any requirement of creating a purchase order. The user can also receive money without any creation of sales orders. It also allows you to create and also track your various purchases and different bills too. The user can also receive, items, send payment notifications along with paying the bills. The user can easily bill activities related to customer, employee, etc. It also allows the business owners to track employees’ work hours with its timesheets. The user can also create these time sheets, activity slips, track various work in progress, create rate levels by customer, employee, and activity and also track the time remotely. With this application, you can also track item locations, other variations and sell online. This app allows you to build various kits from items as well keep note of the item details. You can also manage inventory locations along with counts, commit full inventory management, and also receive inventory processes. 1. It helps in running and reporting all areas and aspects of your business whether it is inventory, purchases and order, time billing, sales and invoicing, etc. 2. It also allows you to add payroll forms, credit cards, direct deposit and other services. 3. The vendor offers great service, and you can easily visit support page to get free email support or make excellent use of knowledge base, forum and support library. The only drawback of this application is its complexity. It can be a tedious task to get familiar with this software. One has to invest a considerable amount of time to get hold of this application’s features and tools. 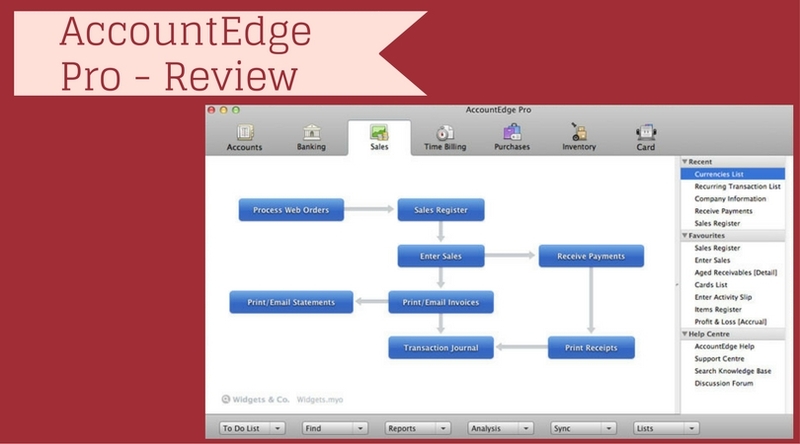 AccountEdge Pro is among the best mac accounting software by a fair margin. Its various features and tools allow you to keep tabs and tracks the various aspects of your business. Its customer support system provides necessary information to its users when the user hits a roadblock while using this software. Tracking inventory, creating quotes and invoices, etc. are just a few of the best features that any user require to maintain his/her business. With this, we end our review on AccountEdge Pro. In case you have used this software, then do let us know about your views and suggestions in the comment section below.